I had some rather unexpected results last week when helping a large consumer goods manufacturer understand the reason for a wide variation in the performance of their Remedy 8 system, as experienced by members of the IT organization. This particular customer struggled with understanding why some members of their workforce experienced response time three times as long as that experienced by the majority of users. In particular, for the ‘Search Work Order’ business activity in Remedy 8, most users experienced an average response time of about 4 seconds. However, a handful of users experienced a response time about three times as long. This clearly had a negative impact on their productivity, reflected poorly on their performance, and interfered with their ability to serve their internal customers. The strange thing was that the ‘slow’ users did not even realize they were less productive when using Remedy as it was consistently slower for them all of the time. Aternity Workforce APM is built to identify and resolve problems like this. Not only does it enable enterprises to define and monitor user interactions with applications in the context of a business workflow (like ‘Search Work Order’), but it also correlates the response time for that business activity to device and network characteristics, application performance, and user characteristics, such as identity, role, department, and geographic group. Isolating the source of delay—infrastructure or PC? The user’s machine, or the users themselves? If the major contributor to delay is Client Time, then the problem is either the client machine, or the client itself. Because Aternity Workforce APM has a deep understanding of the enterprise end user, and can correlate user experience to device and network characteristics, it’s easy to analyze performance by parameters such as geography, department, device type, or subnet. So what was the pattern in this case? 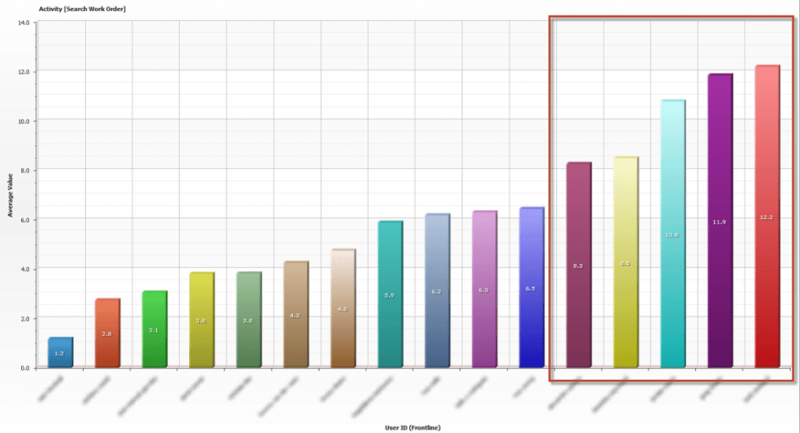 The slowest users were in different locations, using different models of PC on different operating systems. 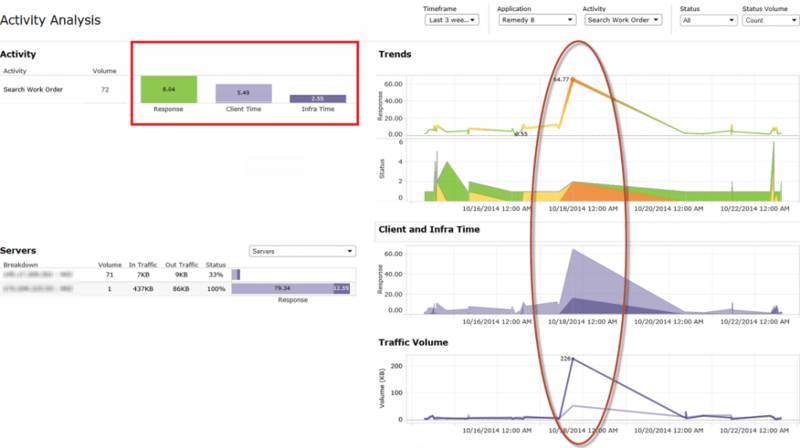 The one thing they all had in common was that when they did a search, they had much more inbound data, as shown by the correlation between Response Time and Traffic Volume on the right side of the dashboard above. Apparently, if you search within Remedy using wildcards, it can bring back a huge number of results which then have to be rendered on the screen, adding several seconds to the transaction. Of course, if that’s the way you had always worked then you wouldn’t know any different! Imagine how thrilled the VP of IT was to learn that the resolution to this particular problem did not involve spending money on PC upgrades, WAN acceleration, or other infrastructure improvements. In this case, rather than spending thousands of dollars upgrading the infrastructure, all the customer needed to do was get one of the ‘fast’ users to train the ‘slow’ users on the best practice way of being more specific in their Remedy searches, to minimize the number of results that were returned. It just goes to show you, sometimes the problem is not the network or the server. And it’s not the application or the end user’s machine. It’s the end users themselves. To find the cause of this problem, the users just needed to look in the mirror.